This little feline nugget of mine… y’all I have ALL the heart eyes for this cat! Pressly joined our family a little over a year ago, and she was easily one of the best Christmas presents I’ve ever gotten! 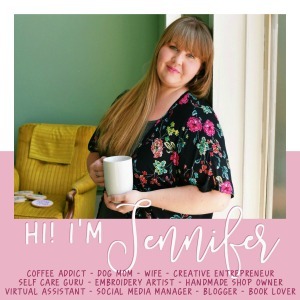 When she joined our little family, the blog dogs (Bitly and Buffer) had some adjusting to do. It wasn’t easy at first… she was so tiny and they were so hyper… but now the 3 of them are the best of friends and life has settled into a pretty regular routine. Cut a hole in the lid of a large plastic tub, and turn that into the litter box. BRILLIANT! Its too tall for the dogs to jump on, and even if they did, the hole is just a little too small for them. The cat has no problem using this holey-bin, its worked for the last year plus, but it is UGLY! Creating a some sort of cover for my little love-bug of a cat’s litter box has been on the to do list for FOREVER! So this week, I enlisted the help of the hubby and we got to building! Start by measuring your current litter box. Ours was 19.5″ wide x 17″ tall x 23.5″ long add 1 inch to your measurements so that you have room to manouver your box around when its time to clean things, and thats the lengths you’ll need to cut your 1 x 2’s. Now its time to measure your rectangular “cube” and cut the plywood. We opted to skip adding a bottom so that its easier to clean when neccessary. Screw in the sides, being sure to get them flush at the top edge and sides. To create the lid we measured the length and the width of the rectangle we created, added 1/2 inch so that the lid would fit easily and cut more 1 x 2’s. Next, we cut out a rectangle of plywood to fit the lid dimensions and screwed the 1 x 2’s into the lid to stabalize the top and give the trim something to screw into. All thats left is to cut the trim to fit and screw that in. We’re almost done! But the lid needs a hole… so we found the center of the lid, drew a circle, drilled a hole and then used the jig saw to cut out a 10 inch-ish hole. We gave our DIY Litter Box Cover a little test run, to make sure she was able to get in and out with out any issues. All thats left is a really good sanding job (can’t have the kitty getting any slivers!). Make sure you sand the top extremely well and the edges of the hole as well. Then its time to paint! We kept it simple with some creamy white paint and a little distressing. Once the paint was dried we added the handles and the hook (for the litter scooper). At some point I fully intend to add some paw prints and maybe personalize it with kitty’s name, but I’m pretty happy with our DIY Litter Box Cover! Its a major upgrade from what Pressly had before! Now that her litter box has been upgraded with this new DIY Litter Box Cover, its time to upgrade her litter too! 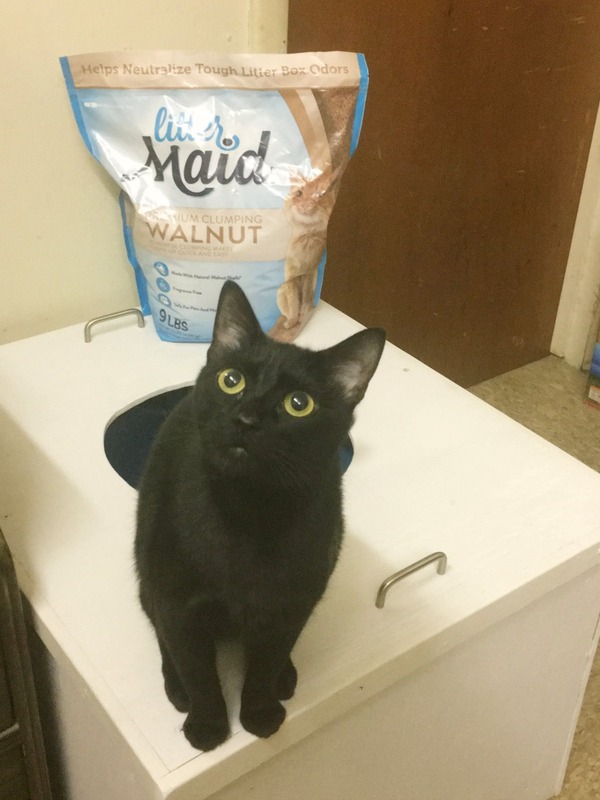 We recently gave LitterMaid® Premium Walnut a try, and we’re both VERY happy with the litter switch! We grabbed a big bag at Walmart on a recent shopping trip, which is totally convenient since thats where we do most of our grocery shopping. Now that we’ve been using LitterMaid® Premium Walnut for a couple weeks, I’ve got to tell you that it is a QUALITY litter! I’ve been extremely impressed with how effectively it helps neutralize tough litter box odors, how easy the powerful cluming makes cleaning the litter box AND the fact that its fragrence and 99% dust free! Winning! Could your cat’s litter box use an upgrade? Would you build your feline friends their own DIY Litter Box Cover? That is a great idea. My sister just got a cat and I think she would love to make one of these for her new addition. Those “surprises” are the worst! LOL! This definitely works well to contain her litter mess in edition to keeping the pups out! For those who have a kitty in their home this would be wonderful to make and use. Keeps the litter from going everywhere. Well now that’s just one crafty idea! No paw intended – wait – Pun hahah. Needless to say, I need to do this! Thank you for a great idea! We have 3 cats and this is such a genius idea!! I’ll have to show my husband for our new house! What a great idea! I might have to do this. I have two cats who like to stink up the house. This might help with that! This is a great idea. We have two black cats that look very similar to yours. How sweet. Oh the never ending war with a litter box. I really love this simple design. Your DIY for this litter box is pure genius. Even though I do not have a cat I can see how useful and a life saver this idea is! This is a pretty wicked idea! I love how it looks and it gives the kitties the privacy that they need. Definitely a must if you have kitties at home. I think that brand of litter is great! I never cease to be amazed at the ingenuity of people! Of course there is a problem to solve and you just solved it! That is one really cute cat. My kids have been asking to get a cat. We haven’t made the decision yet, but we are considering surprising them with one in the next few months. Wow! Great way to make it stylish and efficient for kitties! I’m allergic to cats so unfortunately, this isn’t something I’ll ever need, but my best friend does have cats and I will forward this onto her! I don’t have cats but I think this is a genius idea!! I love that the littler is contained and we all know how much cats love to get in and out of boxes so Win/Win!! I’ll have to try this for my cats! I had an older cat years ago who wouldn’t use covered boxes, but the 2 I have now probably would! We no longer have pets, but what a great idea! Thanks for sharing it with SYC. Such a cute idea! We had bought a littler box with a cover years ago but sadly our cat has gotten too old to climb her way in. This is a much more stylish option though. Pinned.